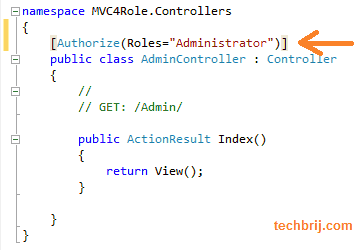 It’s a step by step tutorial to implement custom role provider and authorization in ASP.NET MVC 4.0 with EF 4.x DB First approach. Step 1: Create new ASP.NET MVC 4 Web Application > Template: Internet Application, View Engine: Razor. Select Your tables and stored proc which is related to role functionality, Enter ModelNamespace “SampleDBModel” > Finish. Step 4: Import following namespace and Inherit this class to RoleProvider. Step 5: Click on RoleProvider > Select “Implement abstract class” option. It’ll generate methods of RoleProvider. 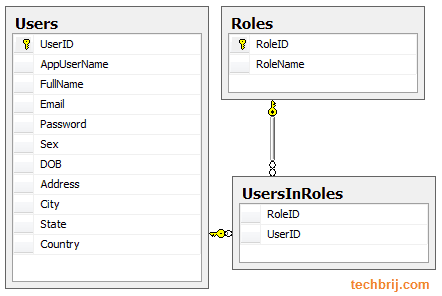 Step 6: implement GetRolesForUser method, It takes username and returns all roles related to user. You can implement above method as per your database structure. Build the Project. Step 7: In web.config update RoleManager Tag and define MyRoleProvider class. Step 8: Now in AccountController > Login HttpPost action, We’ll validate user as per our database structure. 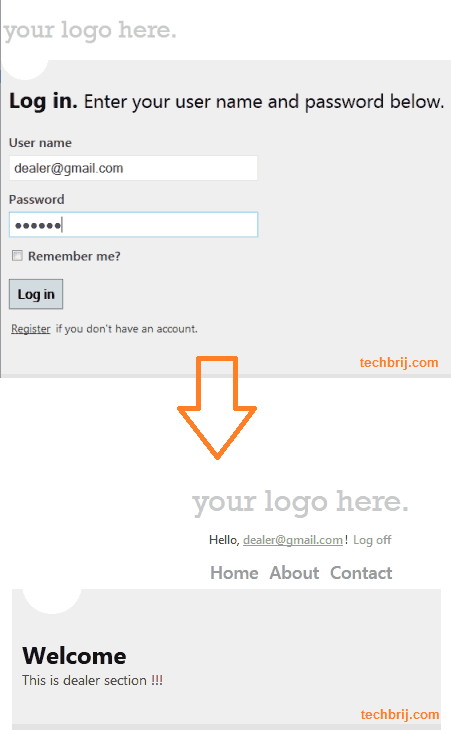 In above method, we are validating username and password and redirect on successful login. You can create custom membership provider, implement ValidateUser method and use it here to check validation. Step 9: You might want role based redirection on successful login. To implement this, let us create one more action say RedirectToDefault. Now one question arises, why to create separate action for this? We can put direct if else in same login action. If we do this then GetRolesForUser or User.IsInRole will not work. FormsAuthentication requires one redirection to set cookies…etc. That’s why we redirects to another action and redirect again to action as per user role. For testing, Create two new empty controllers say Admin and Dealer and create views of default actions. This is Admin Area !!! This is dealer section !!! Note: In ASP.NET MVC 4, default template login is based on ajax. So for testing, open <base url>/Account/login. Similarly, you can update JsonLogin action. No other user can access this controller actions. If dealer tries to access admin controller It will be redirected to login page. Thank You SO much. It helped me a lot. I couldn’t get to redirect after login because i was redirecting right after login and not after one redirection. I can’t get the UserId. I am using User.Identity.GetUserId(), but it is always null. What is LoginModel class and how to implement it? Thanks for the post, it real help me. I get an error “This method cannot be called during the application’s pre-start initialzation phase. Where should is be placed? How to implement dynamic authorization. I have a dropdown which contians different types of roles and i have a checkboxlist which contains all the controllers , so that i can select few controllers and assign to the selected role to access. I wants to use Customized Action Filters which authenticate users when there going to secure pages of the website using AuthorizeCore() or OnAuthorization() which one has to use and how can i use this tel me pls !!!!! I have to authenticated once again to show the (index,Admin) view…. Hi Brij, any way to pass more parameters to a RoleProvider? The RoleProvider get the user roles just using the username, and I need to use the username and TenantId to verify roles. I could search the database myself, but MVC will try to use the RoleProvider. I have a question for you regarding this custom membership provider. Can I create it to a class library? And how do you reference it to web config? In which web.config I need to change? Web.config of View Folder or main web.config of site ? In Which node? Please give more details. Do you have the source code for this project please? I could not understand ‘type=”MVC4Role.MyRoleProvider’. help me. Thank you. You can download the project to provide. Can I create my database with code first approach instead of the ADO entity data model? If yes, I have trouble with assigning foreign keys, could you perhaps show me the code for the properties?